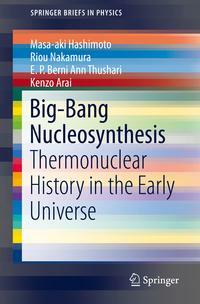 The book reviews theories of nucleosynthesis in big-bang cosmology. It introduces the standard model of cosmology, astronuclear reactions, numerical techniques for nucleosynethsis, and describes in detail the theories that go beyond the standard models, enabling readers to grasp the physics of big-bang nucleosynthesis on the basis of cosmology, general relativity and nuclear physics. In addition, the authors provide insights into the theoretical constrains required by observations. As a consequence, readers find out that big-bang nucleosynthesis still has windows opened to another cosmology. Although the book focuses on highly advanced topics, it is concisely written and mathematical derivations are explained step-by-step, making it accessible to graduate readers. Thus it is a short monograph appealing to a variety of readers interested in nucleosynthesis of big-bang cosmology.